European regulated cryptocurrency exchange DX.EXCHANGE today announced the launch of the token generation event for its DXCASH digital token. DXCASH is the token that powers the first crypto exchange powered by NASDAQ, which allows users to participate in a live social engaging competition until the launch its live platform. With this new loyalty ecosystem, each verified user will be awarded up to 10 DXCASH tokens and will also get the benefit of participating in the exchange’s social engagements to earn more tokens. DX.EXCHANGE is giving away 1.8 million DXCASH tokens (worth $2.7 million) in total as rewards in this event. The tokens will delivered directly into the users’ wallets and are claimed on the basis of completing the registration process. DX.Exchange says it has signed half a million pre-registered users, all waiting for its new Crypto Exchange with no trading fees to go live. According to Amedeo Moscato, COO of DX.Exchange, the exchange is expected complete the beta phase, cut the ribbon and launch the live platform later this month. DX.Exchange has drawn interest for its free trading model, with only a 10 EUR monthly fee for their Lite account. To launch, the company has secured an Estonian license, as well as a market maker license from the Cypriot regulator, which is another advantage the exchange has to offer. Speaking on a video published on DX.Exchange’s YouTube channel, Moscato said the zero-fee trading exchange will participate in London Summit 2018 which takes place on November 13 and 14, organized by Finance Magnates at Old Billingsgate. Indeed, DX.Exchange’s agenda is action-packed with speeches, panel discussions and workshops. Overall, cryptocurrency will be a standalone topic at the summit, and thus DX.Exchange could not pass up such an event. The exchange is scheduled to host an ICO pitch in the hopes of finding promising projects. Held at the London Summit 2018’s Crypto Trading Floor, the demo slam will feature a total of eight to ten projects, which will be competing for a free listing on the exchange at its launch – a perk worth $250,000. 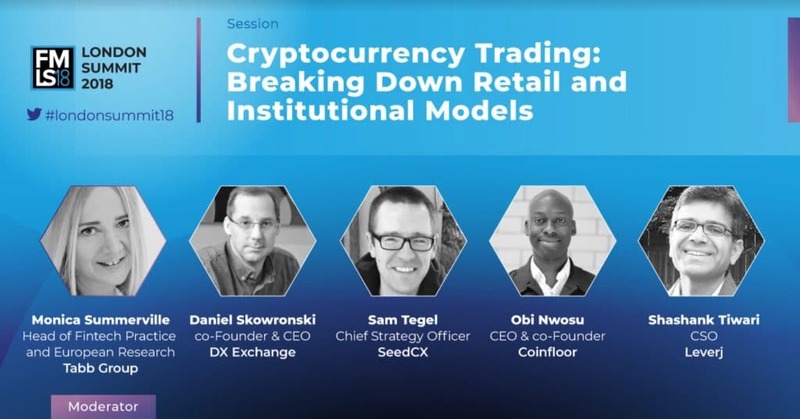 DX.Exchange’s CEO, Daniel Skowronski will also deliver a speech and participate in a session titled “Cryptocurrency Trading: Breaking Down Retail and Institutional Models.” This panel will touch on the specifics of cryptos in both the retail and institutional space, as well as the impact of regulations.